As every person’s case and goals are different, each experience will be slightly different. Expect an individualized experience. Expect to have your concerns listened to. Expect options. Every new patient begins with some basic paperwork. 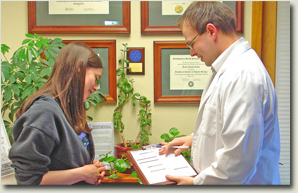 A detailed consultation follows where we discuss your current concerns and health history. Generally, this leads into an examination to pinpoint the root of your problem. At this point, we will either briefly discuss the findings and begin treatment, send for imaging if needed, or refer you to another provider if you aren’t in the most appropriate place. This is when the decisions are made and treatment plans are laid out. We gauge how you reacted to the first treatment. Some people improve quickly, others slowly. Either is fine. We will discuss your particular case, your goals for care, treatment options, and estimated length of care. Most times, treatment is a process - not an event. If you would like your significant other along for the decision, this is the best time. Regular visits are shorter than the first two. We always try to keep waiting to a minimum. Typically visits last 10-20 minutes. Every visit builds on the last.